“GINZA×CSR” Vol. 27 will introduce “cafe 634 (café musashi),” a cozy cafe located in an alley of Higashi-ginza that serves lunch until 5:30 pm. Every day, repeat customers come to purchase their specialty coffee and daily lunch special made from organic vegetables produced in Inzai City, Chiba Prefecture. 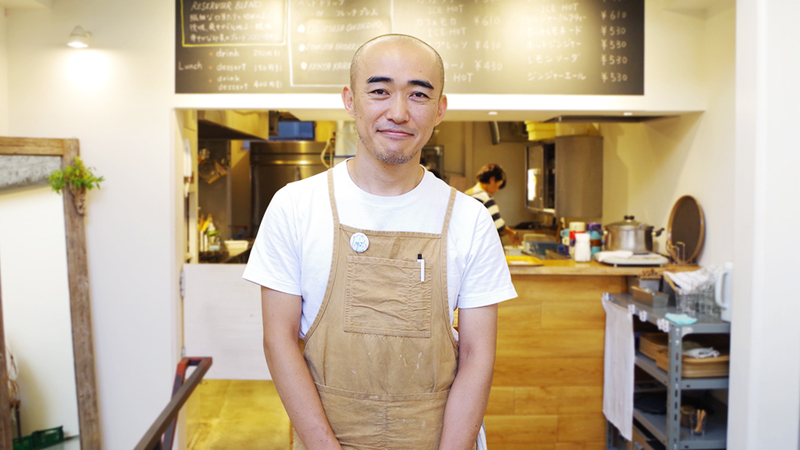 Curious about the thoughts behind the café, we interviewed Mr. Kentaro Kodama, the owner. A daily and seasonal table in Higashi-ginza. ─ Since your opening in 2004, you have continued to offer a lunch menu using healthy and seasonal ingredients until late in the afternoon. What inspired you to open this type of café? This building was originally home to the printing factory of a printing house run by my great-grandfather, When I was 23 years old, teaching social studies at a junior high school, my father who had been the third president of the company, passed away. I took over the company for a while but with the printing industry facing challenging times, I closed the business after a few years. I decided to open a café, which was something that I had always wanted to do. My experiences working in Ginza made me eager to offer healthy lunches made from fresh seasonal vegetables regardless of the time of day. This area is home to many publishing companies and working people don’t always have a fixed lunchtime. However, from my experience, restaurants that serve dinner tend to close after being open for lunch so there were few options left after lunch hour. Therefore, my idea was to keep my restaurant open until the evening and to serve lunch until we closed. Since lunch is something that we eat every day, I wanted to serve meals that resembled the lunchbox that you would bring from home – something not heavy and welcome every day. The multi-tenant building that used to house a printing factory continuing from the Taisho period was renovated in 2013. A spacious and comfortable room spreads under a high ceiling. A heartfelt message is hand-written on the wall to the right of the entrance. ─Serving a different healthy and affordable lunch day after day, you must cook a wide variety of ingredients. How do you purchase your ingredients? I have the vegetables that we use sent directly from an organic farmer in Inzai City, Chiba Prefecture who produces a wide variety of vegetables in small quantities. Since we are a small establishment, it is perfect that we can purchase different varieties in small lots from a single farmer. I aim to use a total of 40-50 varieties through the year and have our customers savor each season. We offer meals with meat and without meat so that our customers can choose according to their daily condition. The coffee that we currently serve is from Single Origin Roasters based in Australia. We want to serve what we can say is tasty with confidence and we lay much importance upon continuing our search for good quality in both coffee and food. The daily lunch special is a combination of a main dish and side dish of your choice. Homemade bagels are also available instead of rice. Repeat customers come several times a week. Some values can be provided only because we keep our business small. ─ Isn’t it rare for a restaurant to employ only full-time staff? I believe that for some reason it feels good when you can always walk into a shop and find someone that you know and can exchange a few words while buying coffee. By having a fixed staff, we can be aware of our customers’ preferences. It also allows us to share our knowledge with other staff members. Most of our employees have ambitions to start their own café later in life or to gain the skills required to pour a good cup of coffee. That is why I sometimes have them devise a menu for special events or brainstorm about how we can make improvements or change. This year, cafe 634 visited Oslo, Norway for employee training. I saw that our employees were inspired by the same values. ─ I have been told that you sometimes sell vegetables at your cafe. The idea hit me when I was helping out on a farm during the one and a half months that the building was undergoing renovation. I learned that during the summer, many different vegetables come into season at once, so sometimes farmers end up discarding surplus produce. That made me want to sell summer vegetables at our café. ─ Besides that, you seem to be full of ideas, producing weekend breakfast menus, art exhibitions, jazz concerts, and other event throughout the year. What is the concept behind this? It all originates in what we feel is “good” and in our connections with people. The pictures that are on exhibit now are pictures drawn by autistic children and collectively photographed by Tomonori Nambu, videographers and photographer. I was moved by the colors of this picture and wanted to share it with more people so I asked Mr. Nambu myself. I want to always be able to offer goods and space that we really feel good about. I believe that is cafe 634’s identity. Cafe 634 also produces many exhibitions with social themes, including some in support of educational aid in Laos. ─ What do you find attractive about Ginza? This area in Higashi-ginza still values and observes traditional customs, such as the New Years’ mochi (rice cake)-pounding event and seasonal festivals. Long-established Japanese confectionary shops offer the glutinous rice used to pound the mochi to put in zouni (rice cake soup) and the street becomes filled with people, from grandfathers and grandmothers to grandchildren. In that sense, the local community remains characterized by a Edokko (Tokyoite) mentality that generates a certain warmth. ─ Are there any dreams that you would like to pursue in the future? To be truly honest, I find the current café a little too big. As much as I enjoy working as a team, I wish for my staff to take their next step in life and launch their own business. And if I could make my dream come true, I would like to downsize and run a store where I can oversee everything. Whether it’s just for a cup of coffee or for lunch, everyone who stops by will hopefully leave with just a little more energy than they came with. That is the kind of café that I aim to create. For that I am determined not to compromise what I feel is good. When I am fifty years old, I hope to be that old stubborn café owner that everyone loves (laughs). Born in 1977 in Yokohama. After graduating from university, Kodama worked as a junior high school social studies teacher before he took over the family printing business in Higashi-ginza. He renovated the printing factory in 2004 to open cafe 634, an oasis that serves healthy lunches until late in the afternoon. The name “634,” pronounced “musashi” comes from “Musashimaru,” the nickname he was called by during high school because he resembled the sumo wrestler of the same name. In 2015, he opened PERCH COFFEE in Omori, where he currently lives. alterna http://www.alterna.co.jp Having worked for several foreign IT firms, Imai shifted the target of her work to environmental and social issues after participating in the tenth meeting of the Conference of the Parties (COP 10) to the Convention on Biological Diversity as an NGO member. She currently conducts interviews, edits and writes articles, develops educational programs and offers interactive counselling sessions.